The green “v” identifies the area where the glass transition occurred on the diagram. The sudden increase in heat flow is caused by the polymer having a higher heat capacity above the Tg than below it. In simplified terms, heat capacity is the amount of heat necessary to generate a specific temperature increase in a material. As seen in the diagram, the sudden upward slope at the Tg indicates the equipment was required to supply more heat to the sample head to maintain a constant heating rate. 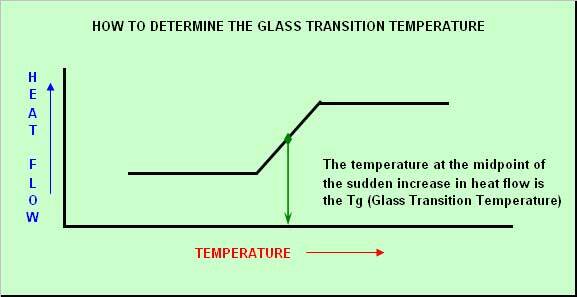 It should be noted that the crystallization peak (Tc) is at a higher temperature than the Tg. A temperature above the Tg allows more freedom of movement of the polymer’s molecules. The molecules have enough energy at the crystallization temperature to rearrange themselves from a random molecular arrangement into a more uniform pattern. 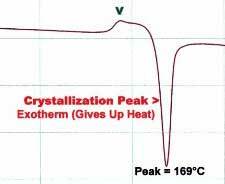 The negative peak indicates heat is given off during the crystallization process. The area captured by the crystallization peak is known as the ΔHc, which is measured in joules/gram. The size of the peak is directly related to the amount of crystallization that occurred. Tm is defined as the temperature at which a crystalline polymer or material melts. Combined with an FTIR analysis, a Tm can help differentiate between such materials as: Nylons (Nylon 6 and Nylon 6/6); Polyesters (Polybutylene Terephthalate (PBT) and Polyethylene Terephthalate (PET)); Polyethylenes (some high and a low density materials); or Acetals (copolymer or homopolymer). The FTIR analysis identifies the generic polymer and the melting point helps to narrow down the polymer type. 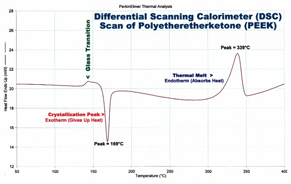 A Tm alone cannot identify a polymer since many polymers have overlapping melting point ranges. A DSC thermal scan can help identify the purity of a polymer. An extra melting point or unexpected Tg can indicate the presence of a second material. The material could have been intentionally blended into the test sample or be the result of sample contamination. Tg is defined as the temperature at which an amorphous polymer or the amorphous portion of a crystalline polymer goes from stiff (glassy) to soft (rubbery). A calculated Tg will show a softening point of a polymer. An unusual Tg can indicate the presence of an amorphous polymer in a test sample. ΔH is defined as the energy per mass unit absorbed when a polymer melts or the energy per mass unit released when an amorphous portion of a crystalline polymer crystallizes. A percent crystallinity value can be calculated with the following information: (1) the measured ΔHc value of a crystallization peak, (2) the measured ΔHm value of a melt peak, (3) the percent total filler content of the sample, and (4) the experimental ΔHm value for the material when it is 100% crystalline. All four items are essential but Item #4, which would need to be supplied by the resin manufacturer, is not always available. Differential refers to the differences in electrical energy supplied to the sample and reference head heaters that are used to maintain a constant temperature for both. A constant temperature is accomplished by the addition or subtraction of an equivalent amount of (electrical) energy to the heater located in the sample head. The differential in energy supplied to the heads, to continuously maintain both heads at the same temperature, is constantly measured. The compensated energy (mW) versus furnace temperature is usually plotted to generate a visual thermal graph of what is happening to the sample during the controlled temperature rate increase.